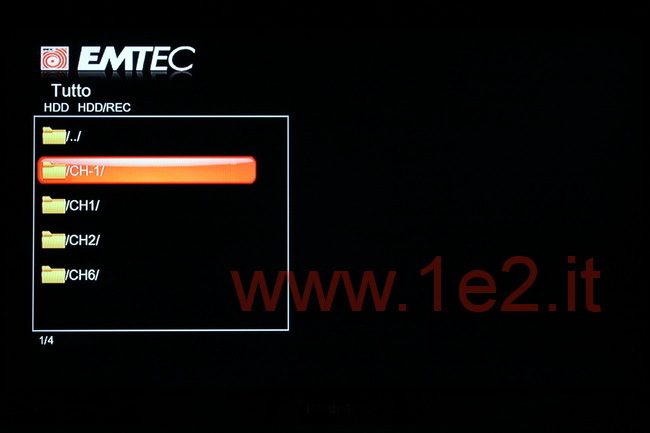 Were arrived from Emtec the new media players FullHD Dual Tuner: the Emtec Movie Cube S850H, V850H and D850H. In this review we were able to analyze the model V850H, but it is almost identical hardware and firmware to S850H and D850H, this review will apply to all. 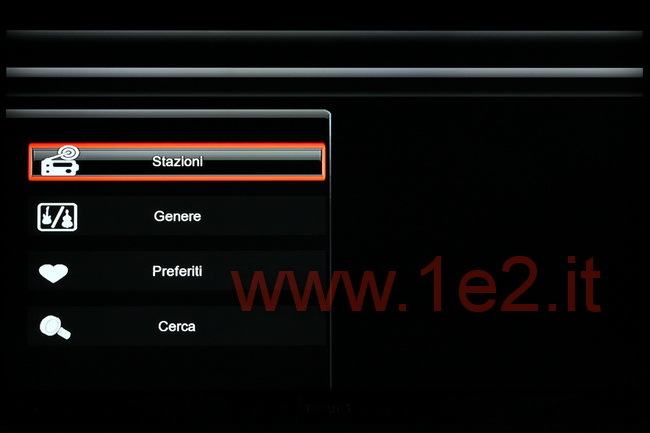 For as you read this other article “Comparison S800H and S850H and V850H V800H” (also this link is in Italian and will be translated soon) with the differences between the models with single and dual tuner are only in the presence of the double tuner for digital terrestrial television in the last arrived. This allows two things: record a program and see a second one, or you can simultaneously record two different broadcasts. Then between the models with the initial S and V, the only difference is in appearance and in the LCD display that is for S800H and S850H while text for V800H and V850H. Then the model D850H has an optical DVD drive. 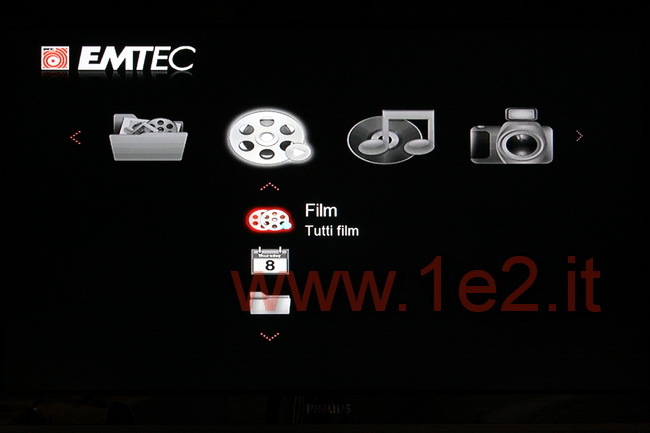 In the package of Emtec Movie Cube V850H you find a remote control with button battery, a printed manual with a CD, a 12 Volt power supply, a cable RCA A / V, Component video cable, a USB cable to connect the player to the computer and a cable Scart-> RCA, which serves to connect the player (RCA) to TV (scart) and for connecting an external audio-video Scart with RCA inputs of the player. In fact, the V850H has no Scart input/output. 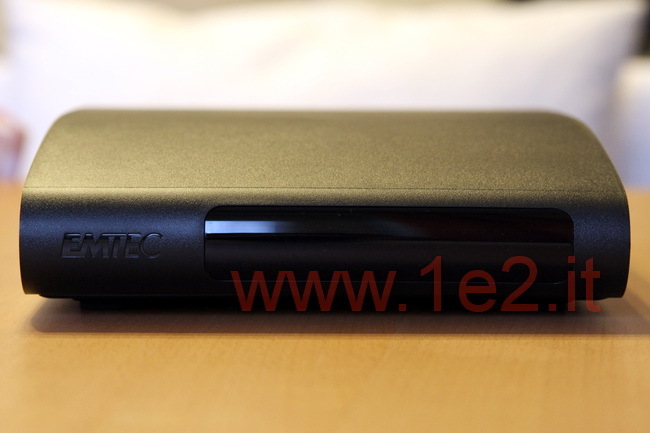 For the package contents and features of the Movie Cube player Emtec S850H read the review on Emtec S8550H, as mentioned above, are identical. 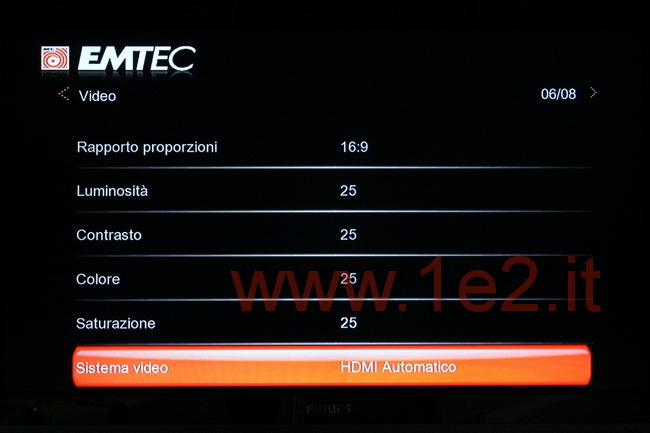 Emtec V850H: the front panel display only shows a text from which we can read both file names as they move along in our files (but not folders, so you can not use the player with your TV off), and the elapsed time of the films displayed. There are also other icons that indicate a recording is in progress, a HD video and so on. But symbols are very small and all illuminated in blue letters on the display, so you can not distinguish from a distance. It can therefore be difficult to understand if there is a recording in progress or not. On the right side we find the power button. It is the only command that is on this player. More central is a fan of 3cm diameter not exactly quiet, but nothing that would interfere. On the left hand is a pretty crappy plastic cover that hides the compartment for the hard disk. The entry system of the disk is identical to that found in Emtec S850H and S800H. The hard disk that we have found already included in the sample is a Hitachi 500GB HDS72105 that’s not really the best for the noise. We also have two USB 2.0 jacks, a USB port for connecting to a PC and an SD memory card reader. Although the lateral position of these connections may facilitate the insertion of cards and peripherals, we must take into account that this implies maintaining a certain gap between, for example, the shoulder of the library and player. If we want to keep a pendrive or a WiFi USB stick inserted, the resulting asymmetrical arrangement is not very elegant. For this would be better than USB sockets on the back for fixed devices such as WiFi and Front socket connections extemporaneous. On the back we have the audio / video connection: those Component (Red Green Blue), those RCA (yellow, white and red) and those for the RCA A/V input, the HDMI 1.3, the optical and coaxial digital audio outputs and then a 10/100 Ethernet port and connection cable for the antenna input and output to daisy-chain other devices to the antenna signal. 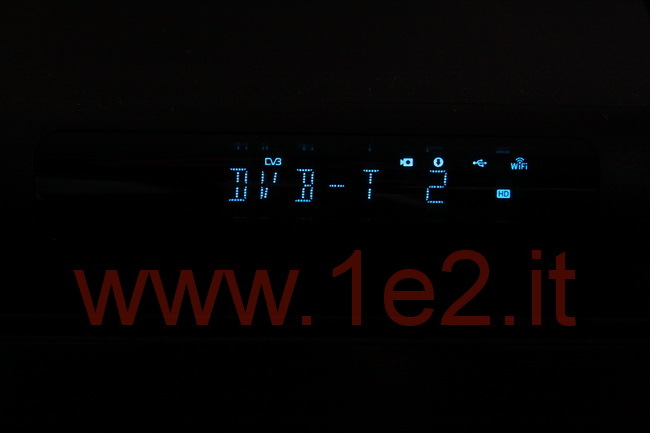 The tuner, which is a dual DVB-T, it occupies the space of a single tuner. There is no hardware button On/Off to exclude the current or to restart the player after a block, so you have to remove the power supply to do it. The case (apart from the sides) is in opaque plastic of good quality, durable and good looking. The feet on the bottom are soft rubber to absorb vibrations which, unfortunately, are generated by a hard disk not silent. So it is really better if you buy the player without the hard disk and then buy by yourself a silent hard disk like the Western Digital Caviar Green. 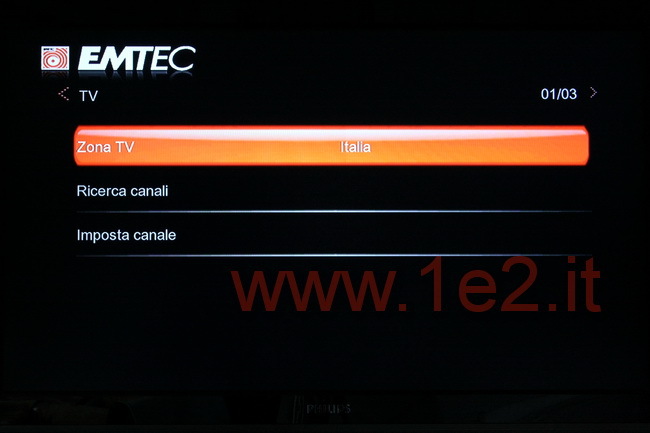 The remote is identical to that found in Emtec S850H and S800H, and so refer to that review for the description. Also in this section, there is no difference with previous models. The list of media files can be divided in Film, Music and Photos sorted and displayed through a database. 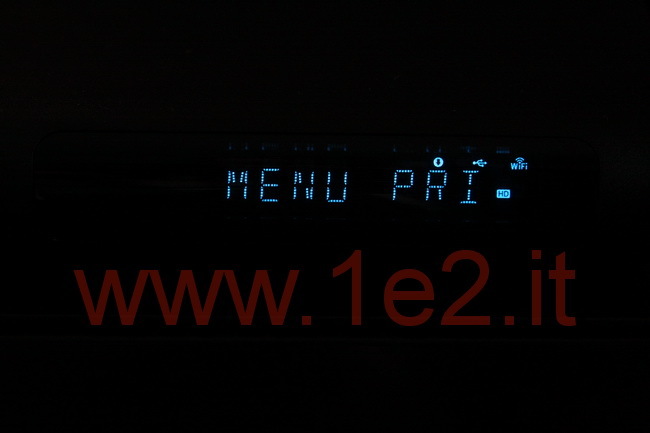 Or you can view the contents of the internal disk or connected via USB or via the network. 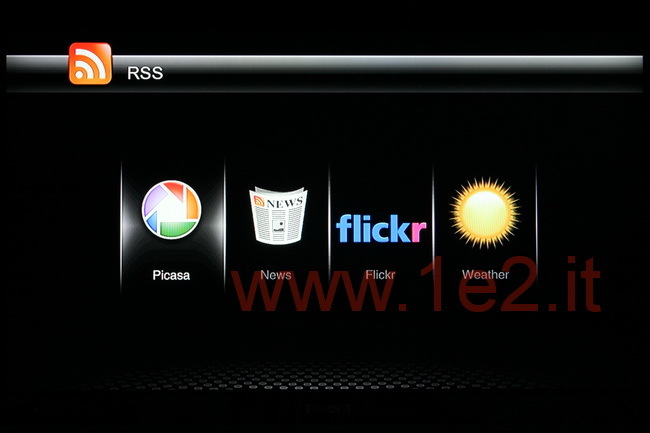 With the exit of the last firmware we now have new internet services in addition to those listed in the previous model in the previous review: In addition to RSS, the BitTorrent client, the Samba server (now compatible with Windows 7) and the iRadio, we now have new basic services that are links to Picasa, Flickr, News (again via RSS) and Weather service Online. But the FTP server is not there, so you can not access the files via a remote computer from the Internet, such as the office. There are still links to services like YouTube, but in recent weeks all players based on Realtek 1283 chipset is also being updated with this possibility, so we believe that it will soon be implemented even on Emtec models. 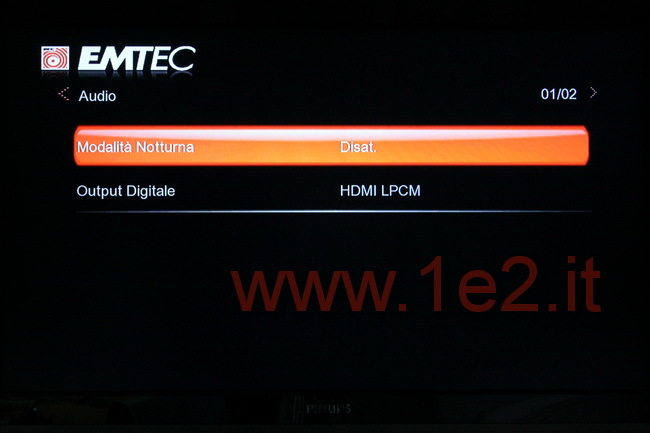 We come now to the real news which concerns the Emtec V850H and Emtec S850H and Emtec D850H: the DualTuner for digital terrestrial television in HD. The module occupies a single bay, just like a single tuner, so you don’t have to make multiple connections to the antenna input. 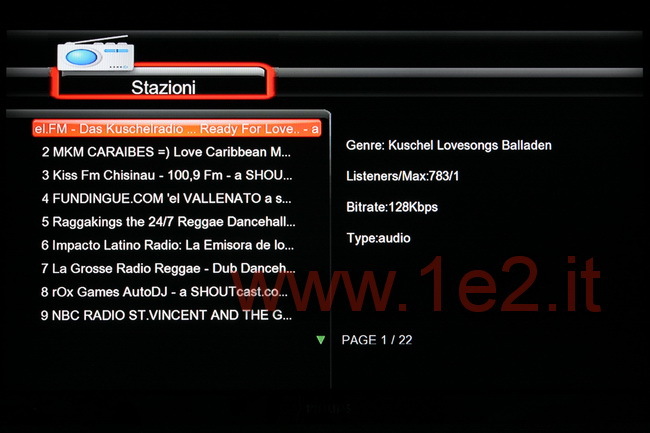 Who is already in possession of a TV with DVB-T built-in does not need a dual tuner to record one channel and watch another. But the real and important change, which strangely no one points out (maybe because nobody knows) is that you can simultaneously record two TV channels! This is the great value of the dual tuner. 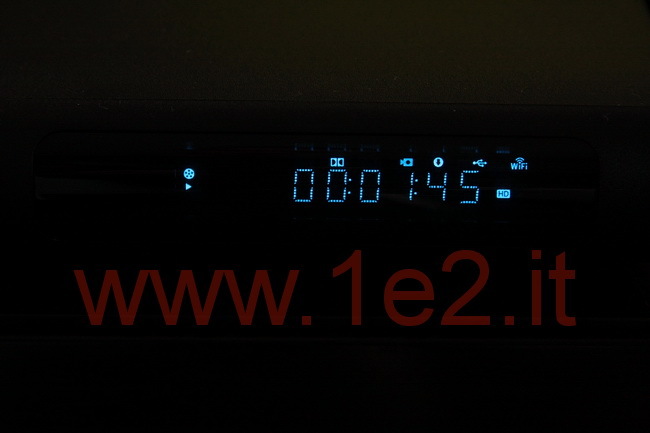 You can set the timer for two different programs on the air at the same time, never miss the start of a program to record because you’re still finishing up another record! There will be no conflicts in scheduling with timer (unless you set three records simultaneously). But is not everything, while you are recording two programs you can also see an HD movie that you have on hard drive without any problems. 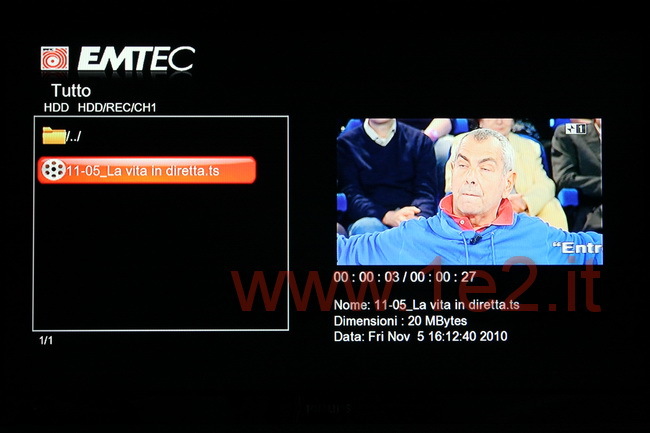 Recordings are saved on the hard disk in format TS (Transport Stream) in MPEG2 or MPEG4 (SD or HD). It is not a proprietary format the TS, you can read it with any computer. But still lacks the ability to edit videos with tools such as cut and paste to remove the publicity. To date, no player based on Realtek 1283 chipset does. When you register a channel and watch a second, strangely Timeshift is no longer usable. So the Timeshift only works if you are watching a single channel with no other records in course. It ‘quite strange considering the ability of the player. Hopefully in a future update. Consumption have not changed compared to previous models S800H and V800H. 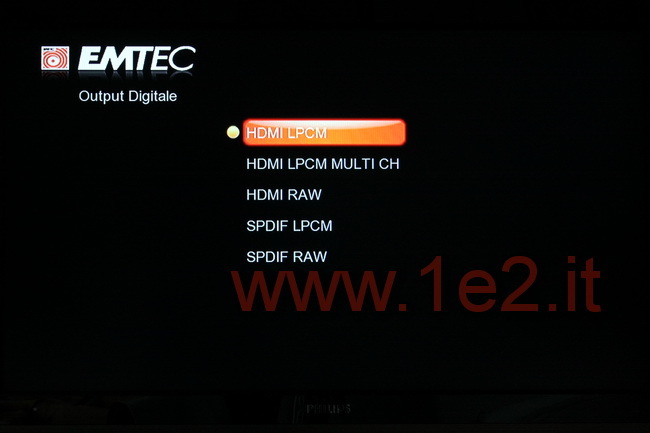 It ranges from 18.7 W to 21Watt idle while watching an HD movie. While in standby consumption drops to 0.5 W due to the fact that the player goes into a deep state of standby for this reason it takes almost 30 seconds to turn on whenever the Emtec S850H and V850H and D850H. Very positive is the presence of the 250MB of RAM against the usual 120MB of other players. During the test, especially when testing records, there have been abnormal behavior and block that required a restart of the player pulling the plug. Even if the firmware comes from long experience with the models S800H and V800H, we still have to give an excuse because of the double tuner is new and therefore a bit we expected some instability. However, we hope that problems will be solved in future firmware. So my opinion is that this firmware is not stable. The choice of an Hitachi hard drive is not very good idea, there are a lot quieter drives like Western Digital Caviar Green, then I highly recommend to buy the player with no disc inserted and you take it apart (if there are models without hard disk). 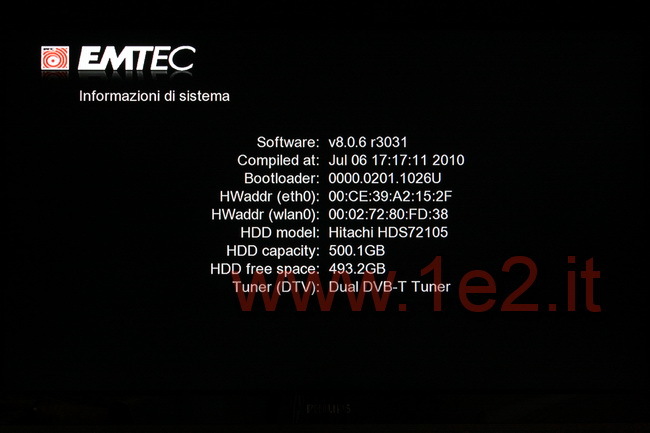 Although some stylistic choices are not exactly hit (as the arrangement of the side in the V850H USB and the LCD in low quality S850H) the Emtec V850H, S850H and D850H are valid. 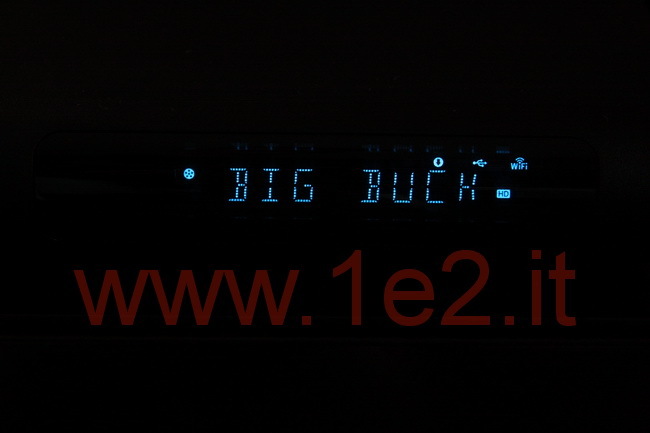 For those who is a fan of television, a media player with dual tuner is definitely an object to be under the TV! For questions or problems, refer to the section of the forum dedicated to Emtec player where you can find many others who will help and give advice: Emtec Movie Cube Forum. 13 queries in 1.075 seconds.